General Hospital (GH) spoilers tease that Ava (Maura West) could find herself in quite a jam soon. She finally managed to score a visit with Avery (Ava and Grace Scarola) and she’d obviously like to enjoy more of them. The last thing Ava wants to do right now is rock the boat. That’s why Ava’s fine with being in the dark on Nelle’s (Chloe Lanier) latest plot. She’s all about plausible deniability. The less Ava knows, the better off she’ll be if it all blows up. Unfortunately, there’s no way Ava can stay in the dark indefinitely. Ava may grow curious and start digging or simply discover the truth by mistake. Regardless, Ava will undoubtedly object to Nelle’s cruelty. Despite what Sonny (Maurice Benard) and Carly (Laura Wright) want everyone to believe, Ava isn’t a total monster. She’s got some good in there somewhere, especially now that she’s dating Mr. Goodness himself. Ava’s never going to have the same morals as Griffin (Matt Cohen), but he’s still rubbing off on her. She certainly won’t think Nelle should exploit Morgan’s (Bryan Craig) death. After all, Ava truly cared about Morgan. She only accepts partial blame in what happened, but she deeply regrets her role in his demise. On March 21, Ava will confront Nelle about her behavior. Perhaps Ava will realize Nelle’s “haunting” Carly and trying to drive her over the edge. Ava may argue that Nelle’s taking this too far. She’s been serving as Nelle’s mentor lately, so she won’t want to rat her out. Nelle is pretty much the closest thing Ava’s got to a friend. Instead, Ava may scramble to sabotage the next phase of Nelle’s plan and put a stop to any other ruthless moves. General Hospital spoilers say Nelle will deal with some frustration on March 22. She can’t just bail on this scheme now! Nelle won’t want to throw away the progress she’s made, so she may sidestep Ava’s damage. GH fans can expect Nelle to make her boldest move yet on March 23. She’ll be forced to take drastic action against Carly, so it sounds like big trouble’s brewing. Nelle might get her hands on a lengthy recording of Morgan’s voice. There’s bound to be something posted on the Internet that she could edit. A couple of distorted words here and there aren’t going to cut it. Nelle needs to up the ante. If Nelle can make it seem like Carly’s having a full phone conversation with her deceased son, that would go a long way toward achieving her goal. Carly could be going out of her mind before you know it! Nelle could even hire someone to pose as Morgan and “haunt” Carly in person. Will Ava eventually snitch on Nelle or could she be blackmailed into staying quiet? 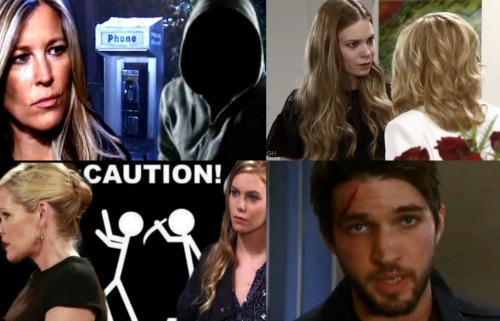 We’ll give you updates as other General Hospital news comes in. Stick with ABC’s GH and don’t forget to check CDL often for the latest General Hospital spoilers, updates and news.